Portland is right at your doorstep in this upscale downtown condo. 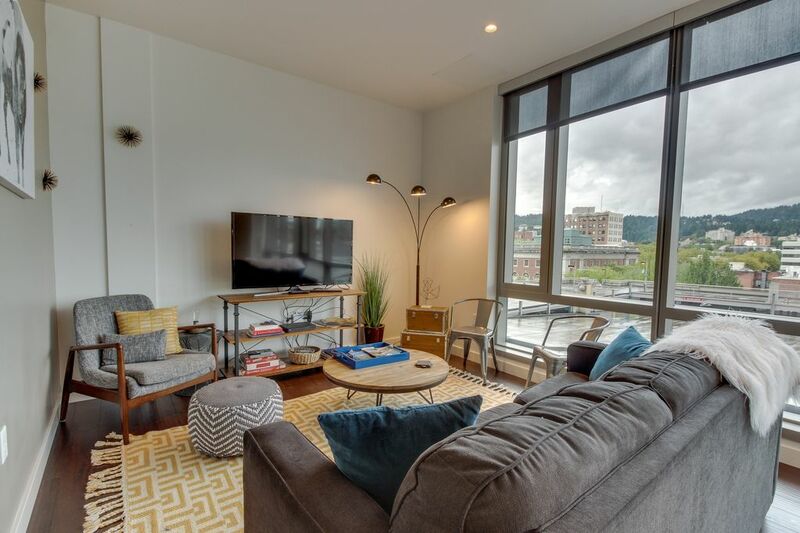 Featuring beautiful city views overlooking the West Hills, hardwood floors, floor-to-ceiling windows, and quartz countertops, this dog-friendly condo is great for couples, business travelers, or your solo getaway in one of the most beautiful cities on earth! This condo is in the perfect location in the Park Avenue West building downtown, within short walking distance of shops, restaurants, public transit, and all the most popular tourist attractions. This modern space has a fun a comfortable sofa, along with wall art and rustic-chic touches. In the living area, you'll fall in love with the hardwood floors, comfortable furniture, and flatscreen TV with a Blu-ray player and Netflix streaming. Keeping in touch isn't hard with free WiFi throughout - make sure to bring your laptop! Though you're certainly going to want to try eating at as many downtown Portland restaurants as you can, you'll also love cooking in your fully equipped kitchen! Everything you need is provided for your use, and you'll have a two-seat bistro table when it's time to eat. Four humans can sleep here in a sleeper sofa and spacious bedroom with a queen-size bed and wonderful views, but feel free to bring the dogs along too! A 25-pound weight limit and a small nightly fee do apply. The bathroom has a bath, shower, and a sink with the same quartz countertops as the kitchen. Other amenities include a private washer/dryer tucked into the hallway closet, a high-efficiency air conditioning and heating system, and an iron and iron board for your use. From your spot in the Park Avenue West building, you can walk to the famous food cart pod on Alder Street, VooDoo Doughnut, Powell's City of Books, and more! Stop by Whole Foods or the farmers market (both within walking distance) to cook up dinner, or choose a nearby restaurant to try. The MAX, Portland Streetcar, and TriMet buses are all just on your doorstep so you can go north to the Pearl or explore trendy neighborhoods on the Eastside. The Central Eastside Industrial District, just across the Hawthorne Bridge, has exciting bars and eateries in repurposed buildings. Stop by Kachka for dumplings, and afterwards, grab drinks at Dig a Pony! See the sights, take in the views, or simply relax and enjoy - this sophisticated and modern downtown Portland condo has everything you're looking for and more! Note: Parking is not included with this rental, but there are several paid parking options nearby. I loved everything about my stay, from check in, to the amount of dishes in the cupboard. The only thing I was Leary about was they contacted me 5 days in advance because gthe City of Portland wanted some information about me. I thought most of that had been cleared up while booking. Hi Jamie, we are so glad you enjoyed your stay! The additional information required is part of a new municipal requirement that the city has imposed on vacation rental operators. He hope it was not too much of an inconvenience for you. We would love to host you again! The whole building was classy and high end. I felt at home. Nice visit to the city! Clean, beautiful, walking distance from everything. Wonderful experience! This apartment was exactly as advertised. My check-in was smooth, and the apartment was spotless. The location is truly in the heart of downtown Portland. The place was spacious and all the necessities I needed for staying a few days, from towels to laundry detergent. My view was of the parking lot across the street but it wasn’t terrible. I loved it was walking distance to the food carts and other attractions. I will totally keep this place in mind when I visit again !